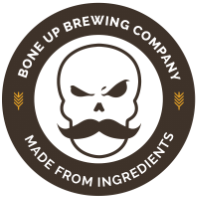 Stats: Beer of Truth - Bone Up Brewing Co.
Color: Reminiscent of well-worn brown leather. Music Pairing (Jared's Choice): "Painkiller" by Judas Priest. Best Occasion to Drink: As you sit in a high-backed leather armchair in front of a fire, contemplating the fates of your enemies. Brewer's Notes: Inspired by a beer name stolen from Jeff Alworth's Beer Bible,* we brewed this hefty strong ale to test our mettle and see what this brewhouse is made of. ** And about a third of the way through that test of skill and will, we realized that it was a truly moronic idea to dump fifty pounds of rye into a beer (we realized this shortly after an equipment failure forced us to essentially restart from scratch. Thus began the longest brewday in Bone Up history). Part Belgian Strong, part English Barleywine, part glassful of nap, the Beer of Truth will shine its light upon you and reveal what you are truly made of (odds are, it will reveal that you are made of somebody who really wants pizza right now). * Incidentally, he's a favorite beer writer of ours, and we'd strongly suggest having a gander at his blog. We ain't affiliated, we're just fans.